Professor Calestous Juma passed away on December 15, 2017. He was a world renowned academic, a passionate advocate for the role of technological innovation in transforming African countries, and for years served as a faculty adviser of the Africa Policy Journal. Professor Juma made the prestigious list of “2017 Most Reputable People on Earth“, which recognizes the high reputation amassed by individuals through their work, and repeatedly was recognized as one of the top 100 Most Influential Africans by the New African magazine. If you are currently in Kenya or set to travel there, please consider visiting Professor Calestous Juma‘s memorial service which will be held on January 4th at the Holy Family Basilica in Nairobi to pay your respects. Below is a remembrance written by Mohamed Qamar, Co-chair of Harvard Kennedy School’s Africa Caucus. 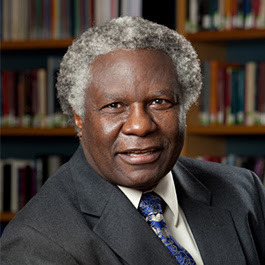 It is with great sadness that we have received the news of the sudden death of Professor Calestous Juma. Reports state that he passed away, here in Boston. To many Africans, he was an unyielding, tireless champion for Africa, especially in the intersection of biodiversity, biotechnology, technological innovation and development. The late Professor Juma started his professional career as a teacher before becoming the first science and environment journalist in his native Kenya, at the Daily Nation. He later founded the African Center for Technology Studies, the first policy research center on the continent to advance use of technology in development. At HKS he was Professor of the Practice of International Development, Faculty Chair of the Mason Fellows Program, and Director of the Science, Technology and Globalization Project at the Belfer Center. Professor Juma was also a towering figure in the world of academia, the African Union as well as various multilateral agencies. But more importantly, in a place where there were too few African role models one could draw inspiration from, Professor Juma filled that void with his captivating presence, insightful perspectives enriched by years of experience working in the Continent, and an indomitable spirit dedicated to African causes. To many of us, he was a source of guidance and wisdom. His sudden death, now, has left us both with a void not only at our HKS African community but also in our hearts. We send our heartfelt condolences to his family, friends and his innumerable followers across the world. May we all honor his memory by carrying the torch of continual service to our continent’s advancement! Rest in honor and peace, Professor Juma!